Since the fiasco with reBar abruptly closing, my fiance and I were left to find a cake for our wedding day 3 weeks before the date (reBar's package included an in-house baker who could have taken care of the cake)! So we put our best to the task of calling up places that we were interested in seeing including some of our local favorites. 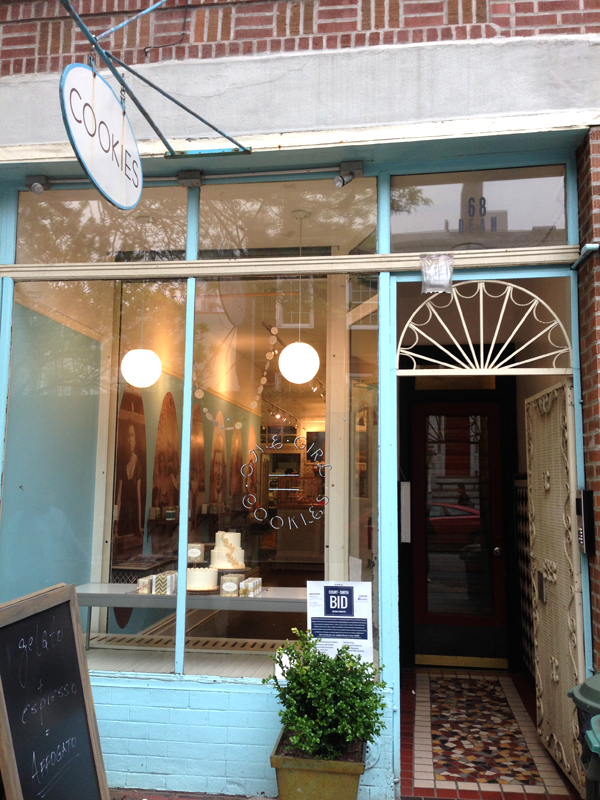 One Girl Cookies was one of our first stops when we first moved into our neighborhood. 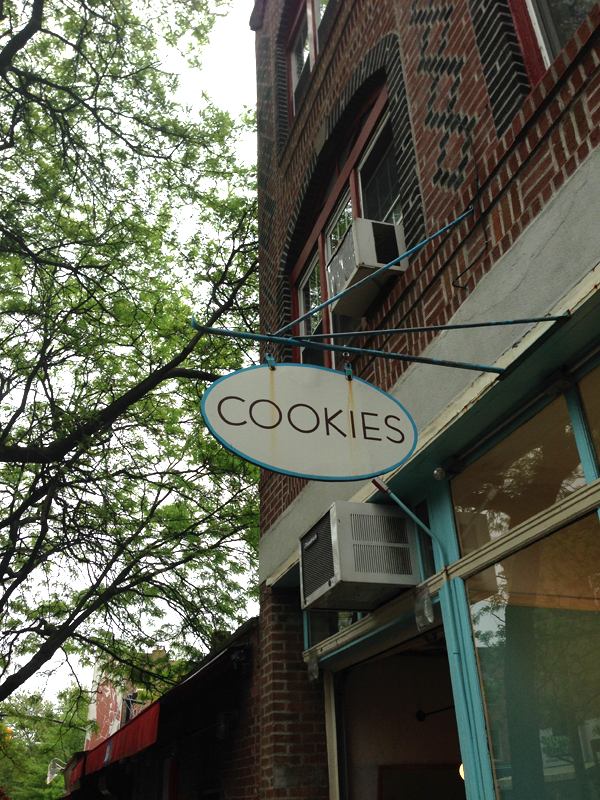 I had spotted a sign that just said COOKIES on it....what more did I need? 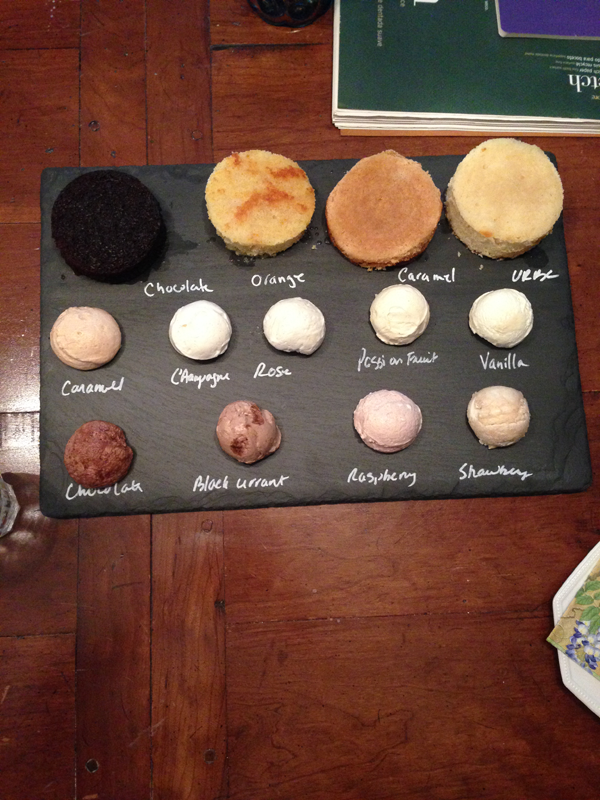 Last Wednesday we met with Rebecca for our first ever wedding cake tasting. It was a total experience! 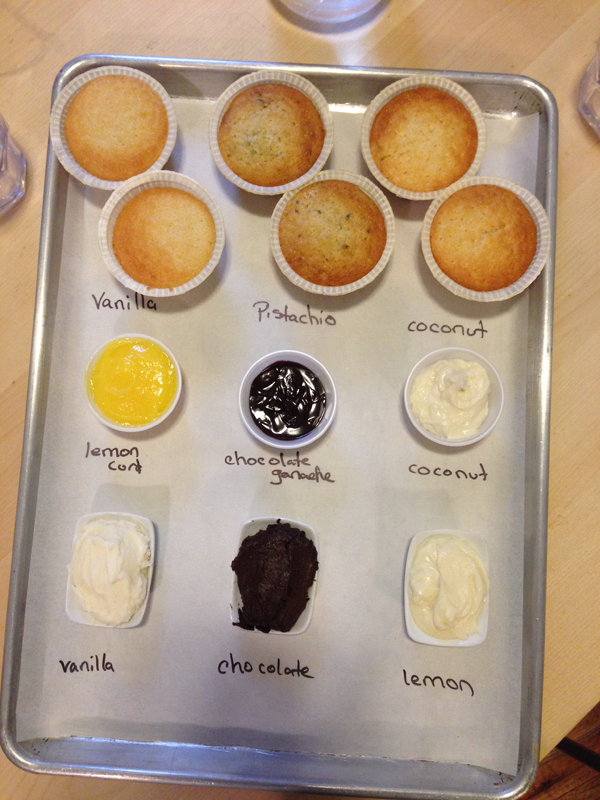 Prior to the tasting we picked out 3 cakes, 3 fillings, and 3 frosting that we wanted to try. When we arrived Rebecca took us to the back of the bakery where all the magic happens. At a small table we were greeted with the cutest little presentation of what we picked out; cake: Vanilla, Pistachio, Coconut fillings: lemon, chocolate ganache, coconut frosting: lemon, vanilla, and chocolate. We got to mix and match fillings with the cakes and frosting. I totally felt like a little kid, making a mess but totally enjoying the experience. Their cakes were light and fluffy. The pistachio cake is nothing like I ever had, it had little pieces of pistachios in it and went great with the chocolate ganache as well as the chocolate frosting. My fiance and I agree though that the coconut cake was by far our favorite. Light, fluffy, and just the right amount of coconut. The coconut filling with the coconut cake was perfection. The coconut filling had little coconut flakes but wasn't grainy, just gave it that right amount of texture and extra flavor. Sugar Couture doesn't have your typical store front....YET! Cake designer Penny Stankiewicz is in the works of taking her studio front to a store front. Either way don't be fooled by her low key store front. We were greeted at the door by Penny and shown to a table where she brought out 3 favors of cake and a ton of fillings on a chalkboard platter. Before diving into the cake we talked about the look and feel of our wedding. She also helped truly design our wedding cake. She took out her sketch book and sketch out our very own wedding cake design right in front of us. Of course, this design includes editable glitter! Anyway, once we had our design set we divided into the cakes. For cake flavor there was: Vanilla, Caramel (her new flavor), Orange, and Chocolate. Fillers: Vanilla, Passion Fruit, Rose, Campagne, Caramel, Chocolate, Black Currant, Raspberry, and Strawberry. We started with the Vanilla cake and worked our way to the Chocolate. At first we really liked the Vanilla with the Strawberry and Champagne fillers. It had the perfect mix of sweet and something a little tart. Her carmel cake was so good by itself that it was hard for me to really like it with any of the fillings. Thankfully, my fiance and I have a similar palette and both fell head over heels in love with Penny's orange cake. It had the right about of citrius. It tasted like summer. Paired with the vanilla filler it just was a perfect summer cake. It was something my fiance and I just kept going back to. 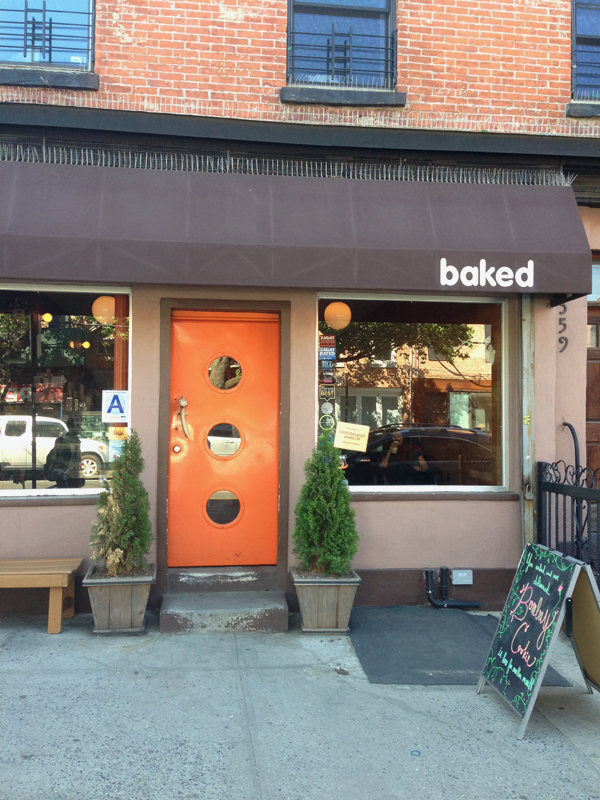 Sunday morning we headed out into Red Hook for our early morning tasting at Baked. What is better then cake for breakfast? We sat with giant cups of coffee as we waited for our cake tasting. It was fun to see what appeared to be the local morning crowd coming in for their pastries and coffee (I'm a total people watcher). Anyway, Jordan greeted us with a huge kind smile and we got down to cake talk. We went over the specifics of the wedding: date, time, and location (at this time it was TBD due to circumstances). Then we looked over some example pictures that Baked has done for weddings before. We fell for the rustic feel of the uneven butter cream. The ombre effect is what really what caught our eye. As we thumbed through the pictures, Jordan explained the design of each one. Once we finished talking shop it was time to taste! 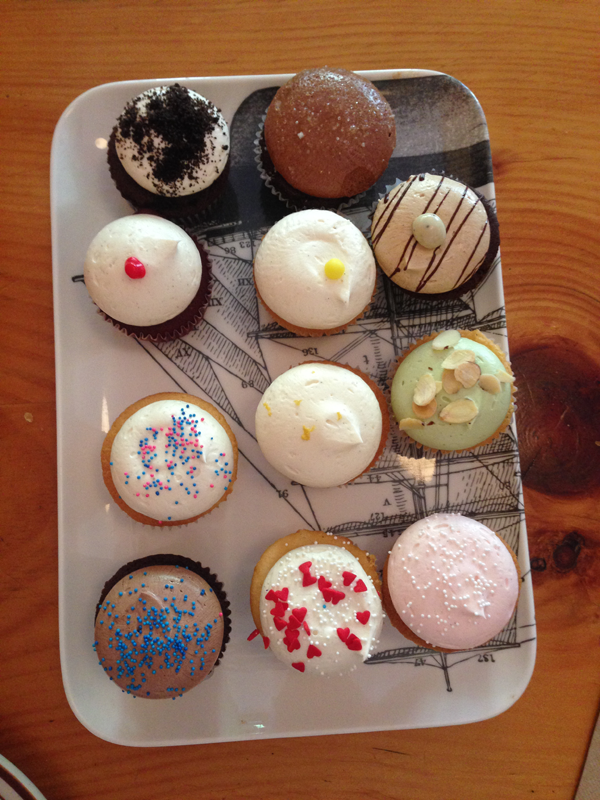 Unlike One Girl Cookies and Sugar Couture, Baked offers you little cupcakes of their cake flavors. Yes, we had a plate full of cupcakes at 10am! Some of the flavors were: raspberry lemonade (vanilla cake, raspberry filling, and lemon frosting), vanilla (vanilla cake and frosting), chocolate (chocolate cake and frosting), and strawberry (vanilla cake, strawberry filling, and strawberry frosting). We accidentally sat in the front of the store and while we stuffed our faces with cupcakes little kids popped in with their parents for their breakfast and we were the parents worst nightmare. The best was this little girl...she turned to her mother asked "Why does she have a plate of cupcakes?" The mother then proceeded to tell her that I was probably doing a tasting so that I can buy a bigger cake. The little girl looked at her mom and went "I want a cookie!" Mom: "You are not having a cookie. You can have banana bread, that's close enough." WOOPS. Sorry parents. Okay back to the tasting...we both decided that the raspberry lemonade was our favorite. The raspberry jelly reminded me the jelly you can find in good jelly donuts. While the lemon frost had the right amount zing and was not overly sweet. The combination of the two gave it a complex taste that was appealing, plus it tasted like summer. The best part of doing this tasting was that we got to take home the cupcakes we didn't finish off! 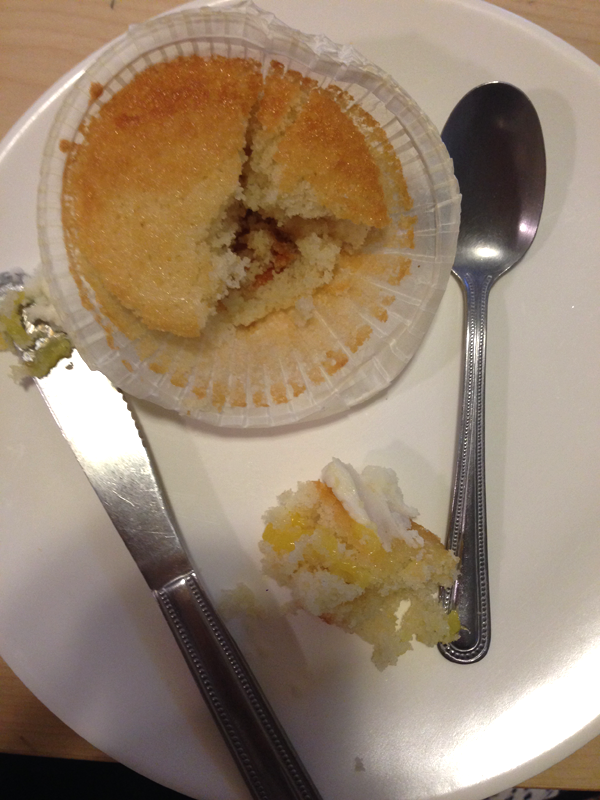 We left Baked with half eaten cupcakes and a sugar high. I must say that through all the chaos of the week prior the best outcome was really meeting wonderful people. We truly enjoyed each tasting and each person we met with. It was an experience that we wouldn't have had if reBar didn't close on us. So yeah as devastating as it has been we are very lucky to have had this experience as well. My advice on cake tasting is to go to a few places. See their styles and try their cakes. Every baker is unique and you'll find what you want or like after a couple of tastings. But which one did we go with??? You'll have to wait for the answer...but guesses are welcomed! I've just been catching up with everything & what you've had to go through sounds absolutely horrendous, I love that despite all that you've been able to see the little positives in the situation though & I hope that it means an even better wedding than you expected in the end! I'm a sucker for caramel, but the raspberry lemonade one sounds amazing too!